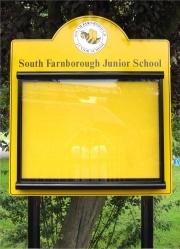 The Scroll Range of External School Notice Boards: Based on a strong, durable 3mm aluminium composite backing panel our Scroll Superior school notice board features a contemporary A1 sized lockable Scroll notice case. The Scroll notice case is securely fitted to the face to create a bespoke external notice board solution. With an aluminium case, door and retractable keylocks the Scroll A1 notice cases are hinged to the top and feature a tough, high impact 4mm polycarbonate clear glazing panel. Manufactured in the UK it has a stylish curved aluminium face profile and is double sealed for extra weather protection. The Scroll Superior range is available in a single standard size. You can choose your insert from a choice of 6 pin friendly loop nylon colour finishes. We offer a FREE No Obligation Design Service where we will work with you to design your new Premium School Notice Board and send you a colour proof for your consideration.